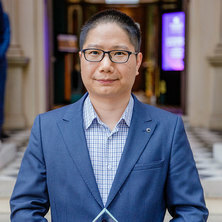 Dr. Hongzhi Yin works as a Senior Lecturer and an ARC DECRA Fellow (Australia Discovery Early Career Researcher Award) with The University of Queensland, Australia. He received his doctoral degree from Peking University in July 2014, and his Phd Thesis won the highly competitive Distinguished Doctor Degree Thesis Award of Peking University. During his graduate program, he worked at Institute of Network Computer and Information System, EECS, Peking University, under the supervision of Prof. Bin Cui. From March 2013 to December 2014, he worked as a visiting researcher at QCIS:UTS, under the supervision of Prof. Chengqi Zhang and Dr. Ling Chen. From June 2012 to December 2012, he worked as a research intern in Microsoft Research Asia (MSRA) and his mentor was Prof. Jirong Wen. His current main research interests include user behavior modeling, user profiling, recommender system, especially spatial-temporal recommendation, user linkage across social networks, network embedding, knowledge graph mining and construction, topic discovery and event detection, deep learning. He has published over 90 papers and won 4 Best Paper Awards and ACM Annual Best of Computing Award as the main author, and most of them has been published in reputed journals and top international conferences including VLDB Journal, ACM TOIS, IEEE TKDE, ACM TKDD,ACM TIST, ACM SIGMOD, ACM SIGKDD, VLDB, IEEE ICDE, AAAI, IJCAI, SIGIR, WWW, ICDM, ACM Multimedia and CIKM. He has been actively engaged in professional services by serving as conference organizers, conference PC member for PVLDB, SIGIR, ICDE, IJCAI, ICDM, CIKM, DASFAA, ASONAM, MDM, WISE, PAKDD and reviewer of more than 10 reputed journals such as VLDB Journal, TKDE, TOIS, TKDD, TWeb, IEEE Transactions on Cybernetics, WWW Journal, Knowledge-based system and etc. Zhang, Rui, Li, Jianxin, Yin, Hongzhi, Reynolds, Mark, Cheema, Muhammad Aamir and Chen, Ling (2019) IWSC 2017 chairs' welcome. 26th International World Wide Web Conference 2017, WWW 2017 Companion, 1315-1316. Yin, Hongzhi and Cui, Bin (2016) Preface. SpringerBriefs in Computer Science, 9789811007477: . Weber, Barbara and Indulska, Marta (2013) Preface. CEUR Workshop Proceedings, 1001 9789811007477: . Sun, Xiaoshuai, Huang, Zi, Yin, Hongzhi and Shen, Heng Tao (2017). An integrated model for effective saliency prediction. In: Satinder Singh, James Crawford and Eric Eaton, Proceedings of the Thirty-First AAAI Conference on Artificial Intelligence, Twenty-Ninth Innovative Applications of Artificial Intelligence Conference, Seventh Symposium on Educational Advances in Artificial Intelligence. 31st AAAI Conference on Artificial Intelligence, AAAI 2017, San Francisco, CA., United States, (274-280). 04-10 February 2017. Sun, Xiaoshuai, Huang, Zi, Yin, Hongzhi and Shen, Heng Tao (2017). An integrated model for effective saliency prediction. In: 31th AAAI Conference on Artificial Intelligence (AAAI-17). AAAI Conference on Artificial Intelligence, San Francisco, CA, United States, (). 4-9 February 2017. Tam, Nguyen Thanh, Weidlich, Matthias, Thang, Duong Chi, Yin, Hongzhi and Hung, Nguyen Quoc Viet (2017). Retaining data from streams of social platforms with minimal regret. In: Carles Sierra, The Twenty-Sixth International Joint Conference on Artificial Intelligence, IJCAI 2017. International Joint Conference on Artificial Intelligence, IJCAI, Melbourne, Australia, (2850-2856). 19-25 August 2017.